“Sabor a Mí” was a recent exhibition showcasing the works of the collective, ArtxCulture, a group of professional contemporary artists residing in United States. The group bonds through a passion for painting, friendship and desire to promote art based on mutual support and respect. 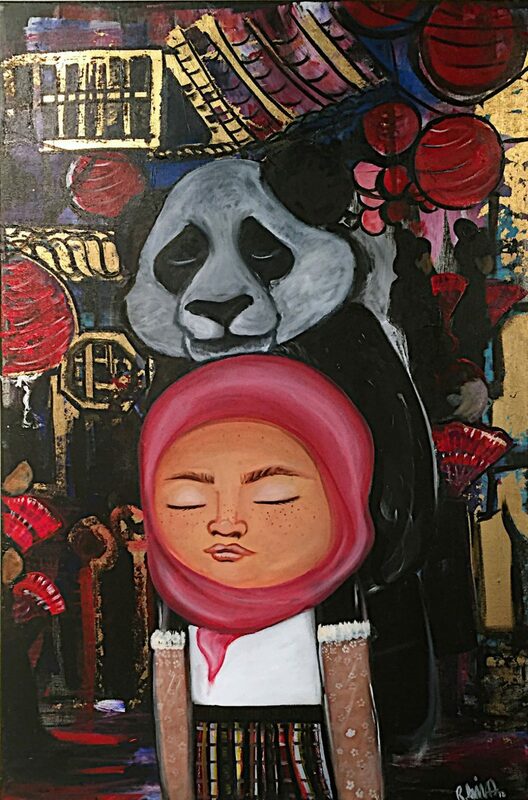 Each of the artists in ArtxCulture has developed a unique style that is distinct from the other members, some through approach to the subject, while for others the subject itself takes on a deeply personal twist. “Sabor a Mí” appeared as a means for the viewing public to appreciate a sampling of ArtXCulture’s artistic fruits, and featured works by Ana Marie Sanchez Varela, Benjamin P. Varela, Diana Montemayor, Fany Mares, Irma Garza Garcia, Ruby Avila, Macarena Peña and Monica Ramirez. This was a generous show, not only filling the South Texas College library’s downstairs gallery, but necessitating triple-tiered displays along one long wall. To observe this much art in a confined space was visually jarring, considering that the works were informed by a variety of subjects, techniques and points of view. The works were strong in their sincerity and each strove aggressively for the viewer’s attention. 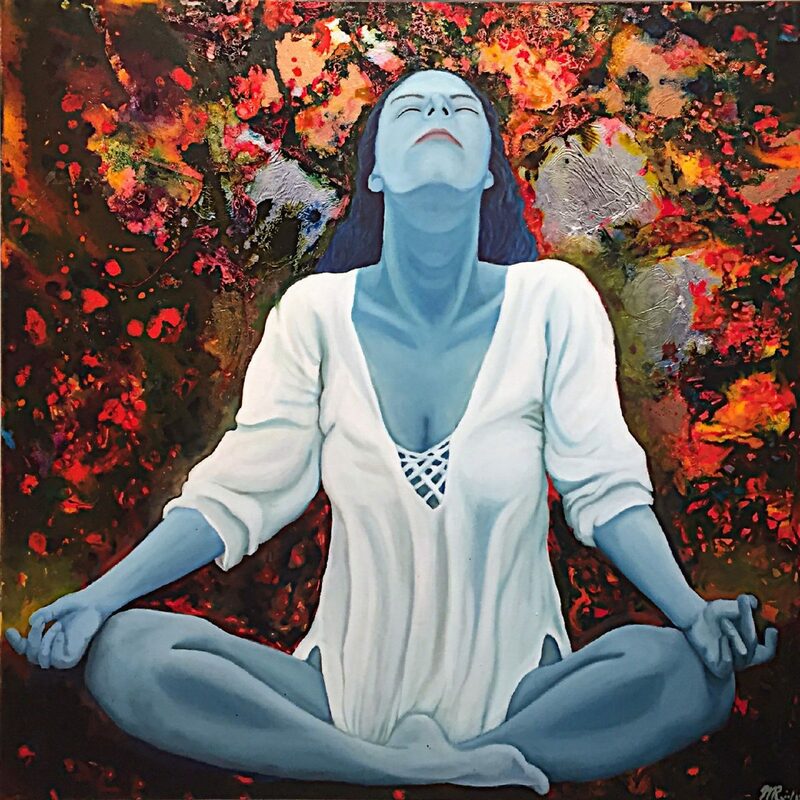 ArtXCulture includes artists with both Mexican and American roots, the majority being women who, in this showing, tended to promote a feminine aesthetic. For these artists, their topics seemed to be of a conservative nature, and even though the collective perceives its members as contemporary artists, this term did not consistently describe the art aesthetic of this exhibition. Most of these works were familiar in their concepts, with a comfortably appeal to the general public. Traditional Spanish realism was beautifully expressed by two artists originally from Monterrey. 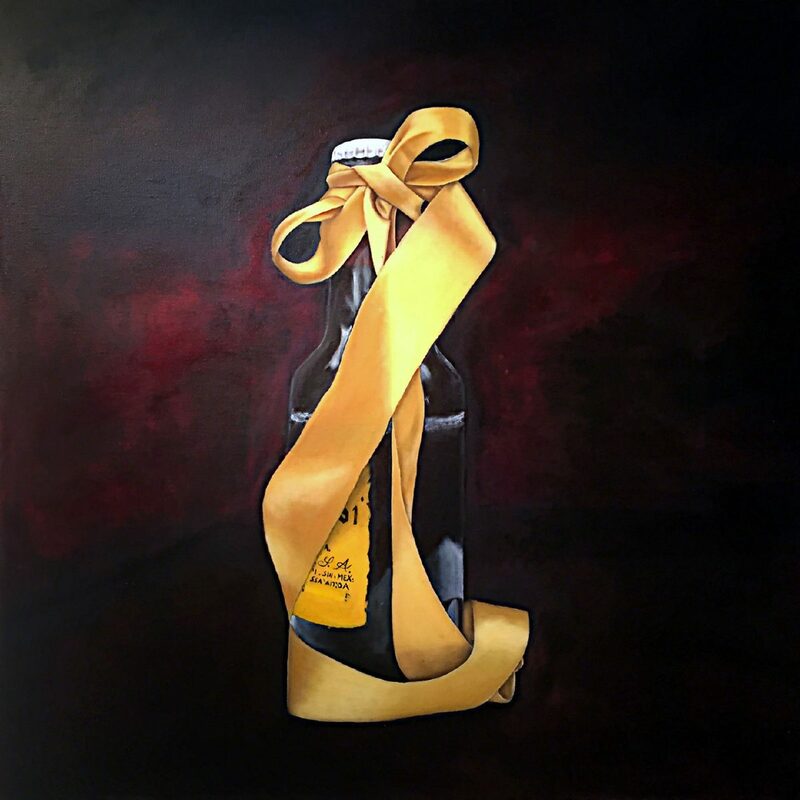 Montemayor and Garza Garcia captured their subjects with ultra-realistic precision, sometimes speaking with an undercurrent of distrust, as with the yellow ribbon in Garza Garcia’s painting, “Cheers,” that blocked access to the celebratory bottle, turning the carefree toast into a dare. Mares exhibited her dynamic textural technique through a variety of subjects. Compared to her previous works, these recent works were more successful at integrating the robust textural directions into the rhythm of her subject. Her “Agave Azul,” full of life and joy, sang of importance to its Mexican tradition. “The Varelas” deviated from the exhibition’s otherwise unanimous painting format by showing assemblages. 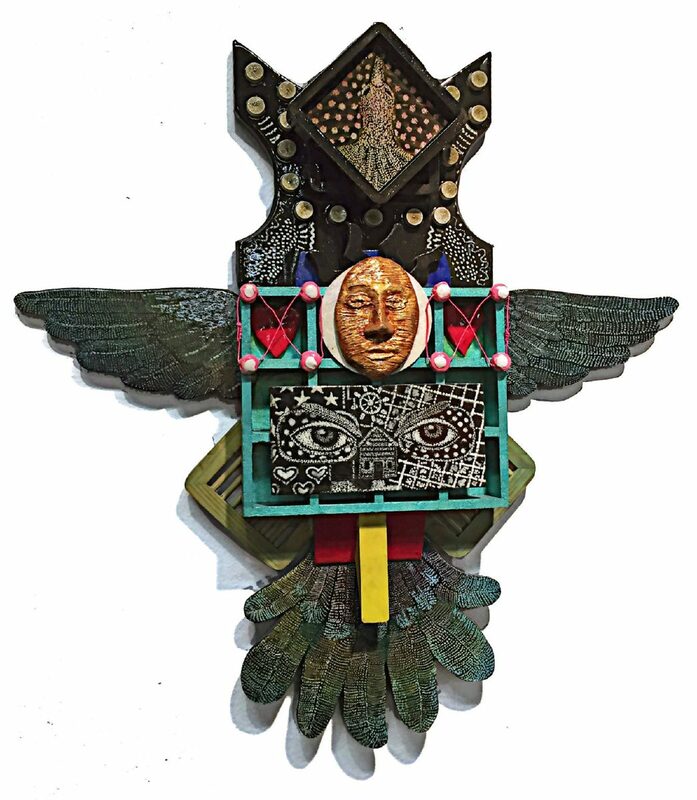 Although Varela has been making beautiful and complex assemblages with combined images for a few years, this was the first assemblage I had seen from Sanchez, who usually paints in a folk-style, documenting Mexican-American life. Sanchez’s “El Carina Falls in Love with La Dama” suggested a tarot card format and used a Modernist approach to reflect contemporary romantic values. Varela’s work, “Make more Humanoid and Less Android,”seemed to play off Ana’s assemblage. Peña’s mixed media work, “A Touch of Love,” was packed with meaning by this blind artist whose work is very tactile, orchestrating the importance of the sense of touch. And while Ramirez was informed by one of her varied interests in the work, “Becoming the Light,” Avila spoke of women’s roles in our society and culture with her acrylics, “Femme lll: Guide,” and “Femme lV: Protector.” Although several of the works in this exhibition have been shown previously in McAllen, this exhibit offered an interesting overview of art that’s happening in this area from this collective. We regret that it did not remain on display a bit longer.